During the Arctic Circle Artist Residency in October 2017, Caroline made molds from “bergy bits” (small icebergs from calved glaciers). She painted melted wax on individual pieces of ice that washed upon the shores of Bloomstrandbreen, Svalbard in Spitsbergen. Read more on Caroline’s website. Writer and Washington State University Regents professor of English Debbie Lee traveled to Svalbard in the Arctic aboard the tall ship Antigua, as part of the Arctic Circle Artist Residency Program. Follow the journey through Lee’s photographs below, and read her essay, “Arctic chronicles,” in the Spring 2019 issue. The headlines paint a dire picture: By the 2030s, global warming could completely melt Arctic sea ice, imperiling the 19 known polar bear populations that range across the United States, Canada, Russia, Greenland, and Norway. Could, as some fear, the trend spell extinction for Ursus martimus? 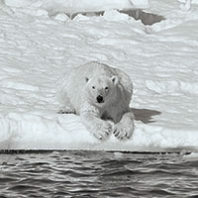 There’s the day the polar bear mangled the meteorological instruments. Or when a massive storm smashed two humidity sensors. Days of howling winds, extremely limited visibility, and weather so cold that power cords snapped like twigs. 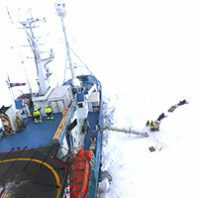 For Von P. Walden, a professor in Washington State University’s Department of Civil and Environmental Engineering, the most exciting day as part of the Norwegian Young Sea ICE Cruise (N-ICE2015) team was last May when the thin layer of Arctic sea ice on which the researchers were working started breaking up.